A closed wing is a non-planar wing surface concept. The term "closed wing" encompasses the annular wing (better known as the ring wing), the boxplane, and the joined wing. Spiroid winglets are a closed wing surface attached to the end of a conventional wing. Closed wing designs are in a sense the maximum expression of wingtip devices, which aim to eliminate the influence of the wingtip vortices which occur at the tips of conventional wings. These vortices, which are a major component of wake turbulence, are associated with induced drag, which negatively affects aerodynamic performance in most regimes. The elimination of the aircraft's wingtips, and thus the great reduction or total elimination of wingtip drag has great implications for the improvement of fuel efficiency in the airline industry. A closed wing surface achieves the minimum possible induced drag for a given lift, span, and vertical extent, and in some cases a span efficiency greater than 1. However, there is no particular advantage to the design; despite a decrease in local loading on any given point on the wing, the circulation is constant, thereby causing no change in the wake, and thereby the lift and interference drag associated with the surface. 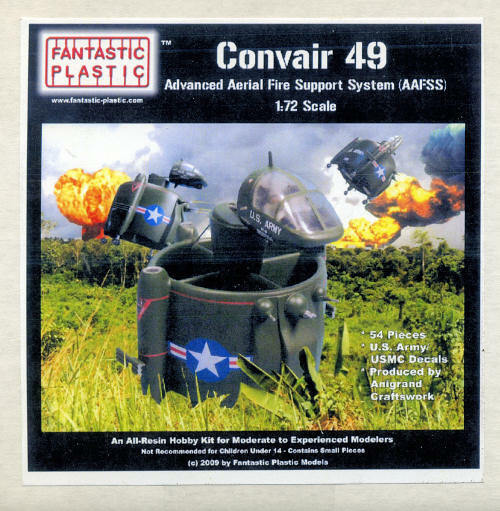 The most unique proposal in the AAFSS (Advanced Aerial Fire Support System) competition came from the San Diego division of Convair. The Model 49 did not fit the normal mold for either an airplane or a helicopter, and represented something entirely new. Propulsive power came from turbine engines driving counterrotating propellers within the shroud. Convair believed that the system was inherently more reliable than a conventional helicopter, and pointed out the only pilot control inputs involved directional control and setting rotor blade angle and engine speed. The crew of two occupied an articulating capsule on top of the shroud and was provided with a full array of sensors. The engines, fuel, crew capsule, and avionics bays were equipped with dual-property steel armor for protection against 12.7-mm projectiles. As a note, this particular competition was won by the AH-56A Cheyenne and was such a disaster that a second competition was held, one eventually won by the AH-64A Apache. A wide variety of weapons were proposed for use on the vehicle. The normal complement included two side turrets with either XM-134 7.62-mm machine guns or XM-75 40-mm grenade launchers. Each turret was provided with either 12000 rounds of 7.62-mm ammunition or 500 40-mm grenades. A center turret carried an XM-140 30-mm cannon with 1000 rounds of ammunition. The center turret could also mount 500 WASP rockets, or a second 30-mm cannon. Each of the turrets could rotate and elevate and was capable of being fired while sitting on the ground, in a hover, or during high-speed forward flight. Mechanical stops were provided that prevented any of the weapons from firing at the nose of the crew compartment when it was articulated forward/down. Four hard-points were located on two of the engine nacelles; each could carry a fuel tank, three BGM-71 TOW missiles, or three Shillelagh missiles. Alternately, one of these hardpoints on each nacelle could carry a single M40A1C 106-mm recoilless rifle and 18 rounds of ammunition. The 106-mm cannon had an effective range of 10000 yards, and was effective against hardened targets. All of the hard points could rotate so that they could be oriented into the wind during high-speed flight, or aimed while being fired from either forward flight or a hover. Four external fuel tanks provided up to 1200 gallons additional fuel for ferry flights. The mission modes for the Model 49 are shown above. The shrouded-rotor vehicle was capable of vertical takeoff and landing, just like a helicopter, and was also capable of hovering. The propulsion system consisted of three shroud-mounted Lycoming LTC4B-11 turboshaft engines, although the General Electric T64, Allison T56, and Pratt & Whitney JFTD12 were also investigated. The engines were coupled through clutches, shafting, and gear-reduction units to contra-rotating variable pitch rotors within the shroud. The thrust and lift systems were extremely interrelated, and the shroud amplified the thrust under some conditions, compensating for the relatively small diameter of the rotors. The engines and gear boxes were located in three of the nacelles along the sides of the shroud; the fourth nacelle contained the weapons and avionics. The overall control system was thought to be similar to conventional helicopters except for the removal of the cyclic pitch feature. Convair planned to leverage the experience gained during the Navy XFY-1 Pogo program in the areas of vertical control systems and power plant installations, and believed the development risk was minimal. Fantastic Plastic is one of several companies that relies on Anigrand to produce their kits. That being the case, all the attributes of an Anigrand kit can be transferred over to this one. It is nicely molded, as are all Anigrand products, with the usual flash, resin pour stubs and other anomalies that will need to be cleaned up before assembly. Though the shroud has resin pins, on my kit, many of them were short shot so will need to be replaced with pins if one so desires. The kit is somewhat complex compared to some and that is due to the arrangement of the engines, gearbox, counter rotating prop and the need for bracing within the shroud. There is a well appointed interior (for a resin kit) consisting of seats and control sticks. 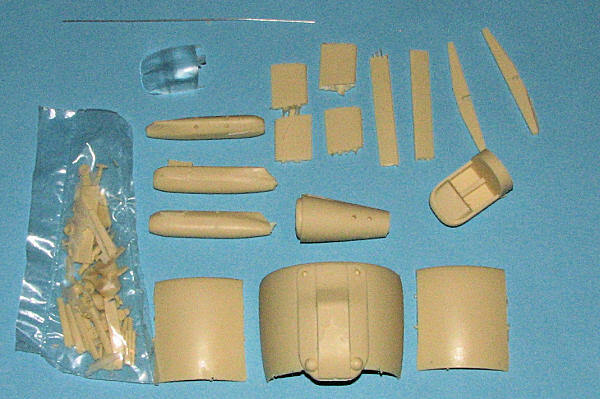 I do wish that these kits would include at least a decal instrument panel and while having belts molded on the seats is fine, I think that decals would work equally well if not better. This is due to the somewhat cloudy cockpit canopy. This clear resin part may be able to be cleared up with some polishing, but really, it could have been molded a bit better in terms of clarity as I've seen it done with other resin kits. The cockpit section has two positions. One is where it is horizontal with the ground with the rest of the airframe vertical. This is how it would normally appear when not being flown or when being maintained or used in ground support mode. For flying and perhaps for static display at air shows, the cockpit was vertical to the airframe. For the horizontal mode, a piston is shown. A section of soft wire is included in the kit. If one is wondering how to get all that stuff into the shroud, basically, one builds up all the pieces that go in there into the half shroud piece. Then the two other shroud sections are fitted and one goes from there. It seems to be well engineered and once all the parts are cleaned up, should build well. Instructions are well done with photos to show where all the bits fit into place. The images are a tad small for these old eyes, but they are effective. JBOT makes the decals. These are ALPS printed with a single carrier and are prone to easy damage so coating them is recommended. The decals are nicely printed and in register. I do wonder at just how opaque the white will be as they are somewhat faint on the sheet, but will withhold judgment until I have a chance to try them. I'd recommend that the white on these sheets be double printed to remove any problems with transparency. Another option would be to provide two sets of white markings so one can double them up. I have to say that this is a neat looking kit. Sure, it will take modeling skills to complete and it won't build over a weekend. However, this is the sort of subject that intrigue many modelers who tire of the usual F-18s, Bf-109s and Se.5s. Thought I rarely start right off on kits, I've already started cleanup on this one. Thanks to www.fantastic-plastic.com for the preview kit. Get this and a number of other cool kits by following the link.